Platter salads are a blessing for those of us who can’t make up our minds about what to focus on when faced with abundance. 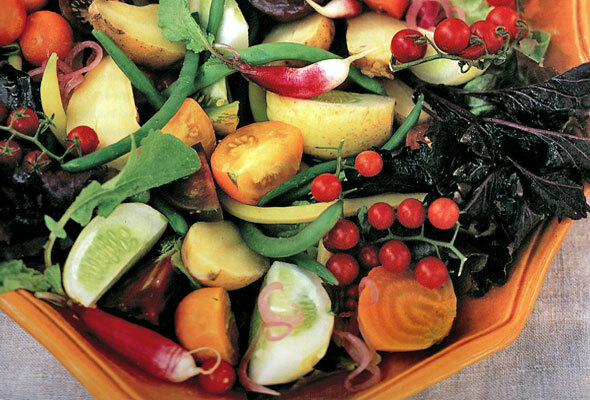 Following the maxims that foods in season together taste good together, and that botanical families offer a unique confluence of flavor, platter salads are bound to turn chaos into success. These salads are simply collections of compatible vegetables, cooked when appropriate, left raw when not, arranged on a large platter, showered with herbs, and bathed with a fine olive oil. The herbs can be as common as parsley, dill, and chives, but the effect of combining them produces such a layering of flavor that you may hear yourself say, as one guest did, “Every bite tastes different!” Of course you can stray toward more exotic herbs as well. Madison dubs this recipe “June Platter Salad,” so named for the time of year when the first green beans, tender little carrots, and French Breakfast radishes appear and “meld quite nicely with a few handfuls of lettuce, herbs, and fleshy purslane leaves.” Like Madison, we find the platter salad concept rather fetching at all times of year, so we redubbed it the “Scale Up–Scale Down Salad,” a reminder that the ingredients can be swapped out fast and easy according to what happens to be on hand or in season. Slip in some roasted golden beets and Sun Gold tomatoes if you please. Take a pass on the tuna if you’re not inclined. The same freewheeling logic also applies to the dressing. Forget the anchovies if they simply don’t appeal. Blend some herbs right in with the vinaigrette. Or rely simply on a drizzle of extra-virgin olive oil as dressing. Suit yourself. 1. Toss the onion with 2 tablespoons of the vinegar and set in the refrigerator. 2. Wash the potatoes, then put them in a small saucepan, cover with cold water, add 1 teaspoon salt, and bring to a boil. Simmer until tender when pierced with a knife, about 25 minutes, then drain. 3. Bring a large pot of water to boil for the vegetables. Cut the stem ends off the beans, along with the tails if they’re tough. If the carrots are small and tender, you don’t need to peel them. Just scrub the carrots, leaving them whole or halving them lengthwise, and keep about an inch of the stems attached. 4. Wash and dry the lettuces, purslane or sprouts, and herbs. 5. In a mortar, mash the garlic with 1/2 teaspoon salt and 2 of the anchovies, if using. Whisk in the mustard, the remaining 2 tablespoons vinegar, and the oil, making a thick, emulsified dressing. 6. When the water boils, season it well with salt, then add the beans and cook them until tender but still a little firm, 4 to 8 minutes, depending on the varieties. Scoop them out and put them on a towel to dry briefly, then toss them, while still hot, with half of the dressing. Season with salt and pepper and heap them in the center of the platter. Boil the carrots until sort of tender but still somewhat firm, 4 to 6 minutes or so, then pat dry and dress lightly, as with the beans. Set the carrots aside. 7. Arrange the lettuces on the platter. Place the tuna, if using, at either end, breaking it up slightly. Halve the potatoes (or quarter them if large) and arrange them on the platter. Spoon the remaining dressing over the lettuces and potatoes and scatter the capers, if using, over all. Drain the onions and strew them on top, too. Place the remaining anchovies on top of the potatoes. Tuck the carrots and radishes into the salad, and add the purslane and herb sprigs. Season everything with pepper. Present the salad arranged. Toss before serving. No matter what combination you come up with, platter salads always make a painterly tableau for the eye. A salad for mid-August might include several varieties of potatoes, green and yellow Romano beans, filet beans, Sun Gold and Green Grape tomatoes, lemon basil, capers, and fresh red onions bathed in olive oil and spiked with aged red wine vinegar. One of my favorite salads was finished with thin rounds of purple peppers and sprays of tiny currant tomatoes. A different version might include grilled small eggplants and zucchini with fresh sheep’s milk cheese. 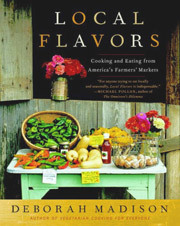 In late August, shelling beans and roasted peppers could go on the platter, while by late October you might turn to shredded kohlrabi and turnips, slivered sweet Jersey Wakefield cabbage, and steamed cauliflower, all drizzled with a mustardy vinaigrette and garnished with leafy accents of arugula or tatsoi. Sometimes I select color as a guiding principle. Gold Rush zucchini or rich yellow Sunburst, orange peppers, yellow wax beans, golden beets, and yellow and orange tomatoes of various kinds together make a dazzling sea of yellow, orange, and gold. Opal basil leaves or amaranth greens make irresistibly gorgeous accents. Bright flavor elements to include on platter salads are capers, olives, anchovies, and pickled vegetables. Cold roasted meats, grilled chicken, tuna packed in oil, hard-cooked eggs, or wedges of frittata turn a platter salad into a complete meal. This salad was a tonic for the massive birthday celebration eat-fest that was last week! It’s a wonderful take on salad Nicoise that can be as authentic as the contents of your larder allows. Mine happened to have lovely multicoloured baby heirloom carrots and beets, haricots verts, fingerling potatoes, icicle radishes, oil-packed tuna and a few hard-boiled quail eggs just for good measure. It was over the top when I added nasturtium leaves and blossoms. The recipe initially looks involved, but if you get into the rhythm of prepping the next vegetable while the last one cooks, it moves along quite nicely. The dressing is fantastic, and I wholeheartedly recommend making a load of it to throw on absolutely everything. The beauty of this dish is that you can make it from one season into the next using whatever is great at the moment. It looks spectacular on a big platter for family-style serving and entertaining. Note: Err on the side of undercooking the beans so that they retain their brilliant colour. Scale Up–Scale Down Salad Recipe © 2008 Deborah Madison. Photo © 2002 Laurie Smith. All rights reserved. All recipes and photos used with permission of the publisher.